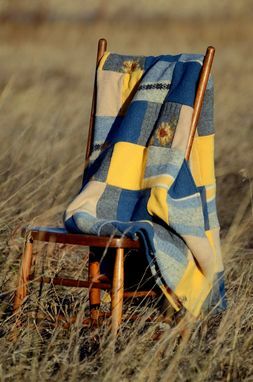 This is an example of a one of a kind upcycled/recycled sweater blanket. 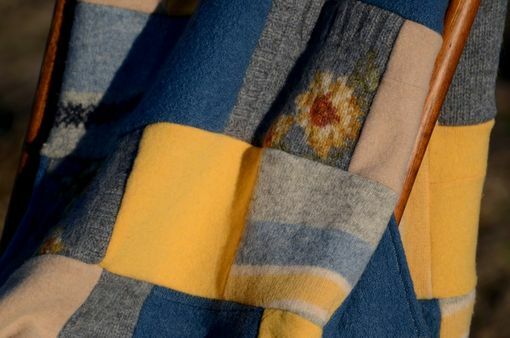 Made from at least five different wool and wool blend sweaters which are felted and then hand cut and pieced together to get the patchwork design. The blankets are lined and edged with a 100% cotton flannel. This is sure to be the warmest, coziest and most unique blanket you've ever owned! Sizes are approximately- 52" x 67" but can be made larger or smaller upon request. Machine washable on Gentle/Hand-wash cycle in cold water. For best results, use Woolite or other gentle detergent. Hang to dry. Air-fluff in dryer and/or iron if desired! Care instructions will be sent along with your blanket.